Discussion in 'North America' started by doug, Dec 21, 2008. 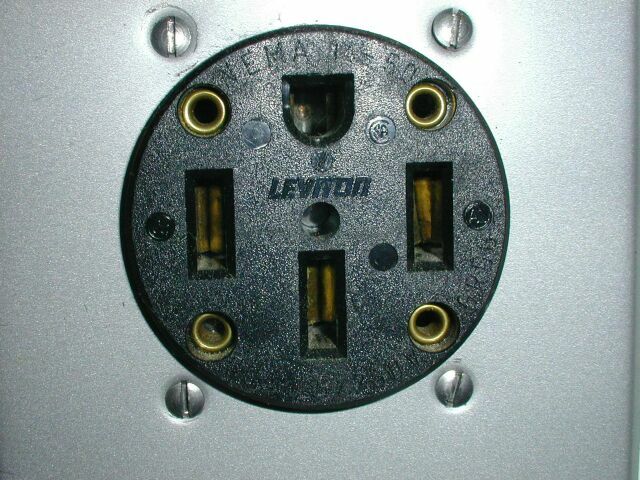 Is that the kind of plug used in RV parks in the US, or do they use something else? No RV parks and marinas usually use twist lock plugs, normally 120 volt 20 and 30 amp plugs. Apparently RV's also use a 3 prong plug similar to a dryer plug as well. Bring adapters when traveling. Yes, the typical 50 amp RV site will have the power outlet box pictured below. It contains 1 NEMA 14-50 - 50 amp 240 volt, 1 TT-30R - 30 amp 120 volt, and your normal 20 amp 120 volt duplex receptacle. And when you get tired of struggling to remove the plug you get one of these. I stand corrected. I never thought they'd use the 14-50 plug for something that needed frequent removal. The handle is a good idea. Moderator's note: Discussion continues from the Road Trips thread. That also goes along with 53kWh giving you 205 miles, so about 258Wh/mile (53000/205). In two hours you got 48 miles, so yeah, about 12kWh (48*258). Do you know the exact amps you were using at both the "50 amp capable" campground and the "30 amp capable" campground? I think it is possible to stop at the Klahanie Campground and charge up for 2hours at 30amp and still make it, or only charge for 1 hour at the border, also the 40amp charger will lower the charge time to 45min. 30 Amp campground connectors are only 120 volt. They only way to utilize these that I am aware of would be adapt it to the MC120 which would only allow 15 amp 120 volt charging. 30a/110v NEMA TT-30 plug, or "30amp" for short. 50a/220v NEMA 14-50 plug, or just "50amp" for short. The manager at the campground said they used to only have 110v/15a outlets until a few years ago! NEMA TT–30 is a 30 A, 125 V recreational vehicle standard which may also be known as RV 30. It is frequently (and sometimes disastrously) confused for a NEMA 10–30. I think the MC240 will work with an adapter like this. then a 2 hour charge up at 30a/120v would give 24mi range. So I gather you could cause a problem if you plugged that into a campground TT-30 by mistake. Apparently they are slightly different sizes, but close enough that you can jam one into the other if you feel determined. Due to the appearance of this plug, many people assume that it is to be wired for 240 V, but this is a 120 V device. The above suggests that some RVs use 50 amp 120V service... I thought all the 50amp sockets were 240v not 120v... Is there such as thing as a TT-50? It appears to let you plug a NEMA14-50 into a TT-30?! Danger will Robinson? It sounds like there are plenty of adapters that let you plug 240V equipment into a 120V RV outlet. Also to plug something meant to draw 50 amps from a socket designed to provide only 30. It sounds like you better know your volts & amps clearly (both source and destination) before you start playing with RV adapters! This RV adapter includes a 30 amp RV plug (TT-30) and a 24" piece of 10/3 cord that connects to a box with a 50 amp 125/250 volt NEMA 1450 receptacle. Made with UL Listed components. So, is the idea that some RVs use NEMA14-50 to get [email protected]? The Cheater box plugs into a 120-volt/30-amp and a 120-volt/20-amp source on separate circuits to give the user a 240-volt/50-amp output. This adapter will not operate on a GFCI circuit. I was under the impression that amperage would be the lessor of the two. Me too... I think 'creative marking' has run amok there. Thanks for that!, but why does it matter if they have 30amp or 50amp hook-ups? It looks like you are using a MC240, so I thought you would be limited to pulling <30amps regardless. Moderator's note: Ongoing discussion about plug standards etc has been moved to the Charging the Roadster thread. Let's keep this one for the road trip stories. By the way, my question got answered. The campground 30 amp connections are apparently 120V not 240V. So using a TT-30 adapter one would have to use the [email protected] or 16amps, not the MC240 at 24amps+. So, yes, a Tesla with an MC240 visiting campgrounds really wants to find the sites that have so-called "50 amp" service. That is a fact that is not explained many places. It is very important to know that in the RV world, 50 Amp service is 240 Volts at 50 Amps from the NEMA 14-50 receptacle that you can plug an MC240 into. On the other hand 30 Amp service is 120 Volts at 30 Amps from a TT-30 receptacle. Also, I have been looking at 14-50 installs in many home sites, RV connections in homes and oven/range installs. Many times the circuit breaker is 40 Amps. If you use an 80% derating for one of these, then you get 32 Amps which is just right for an MC240. See RV Electric for more details. The bottom line is that if you want to use an RV Park with an MC240, look for 50 Amp service. Although there is already a Charging the Roadster topic that covers some of it, I thought it would be helpful to have a topic specifically dedicated to the particular situation found with campground power hook ups. The two most common sockets to find at North American campgrounds are the NEMA TT-30 ("30 amp 120V 'Travel Trailer' socket") and the NEMA 14-50 ("50 amp RV socket").